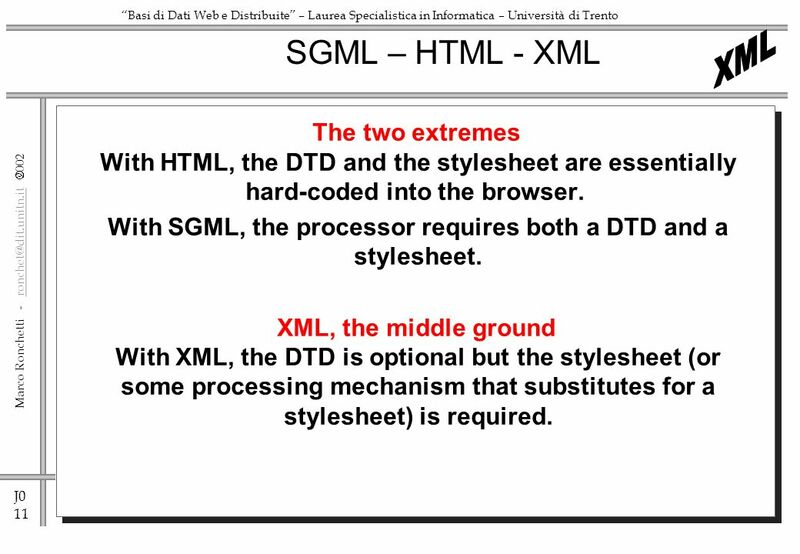 2 J0 2 Marco Ronchetti - ronchet@dit.unitn.it ronchet@dit.unitn.it Basi di Dati Web e Distribuite – Laurea Specialistica in Informatica – Università di Trento What is XML? 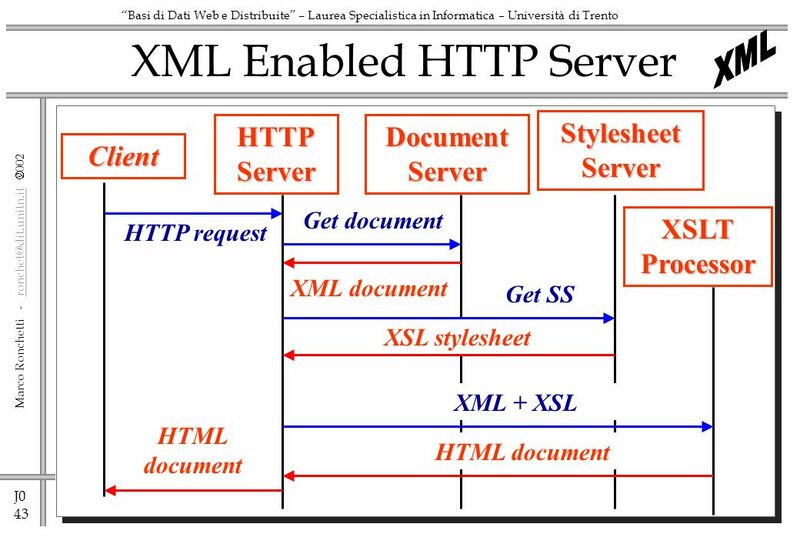 eXtensible Markup Language, or XML for short, is a new technology for web applications. 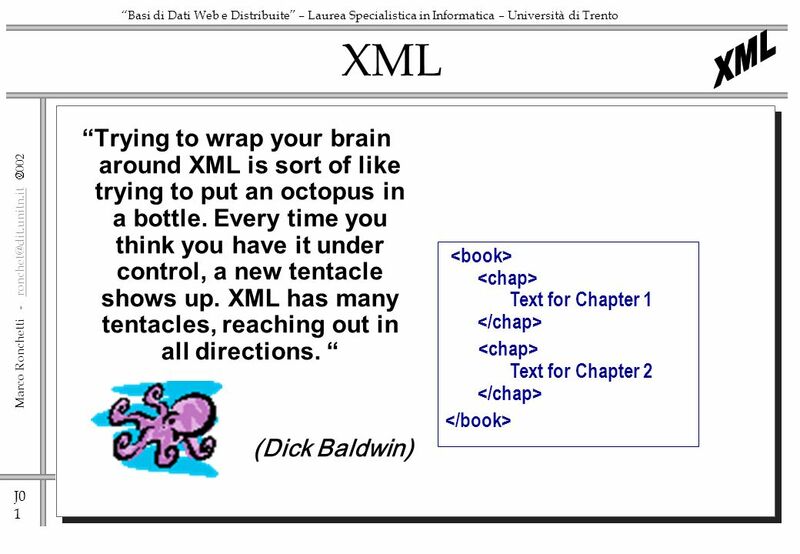 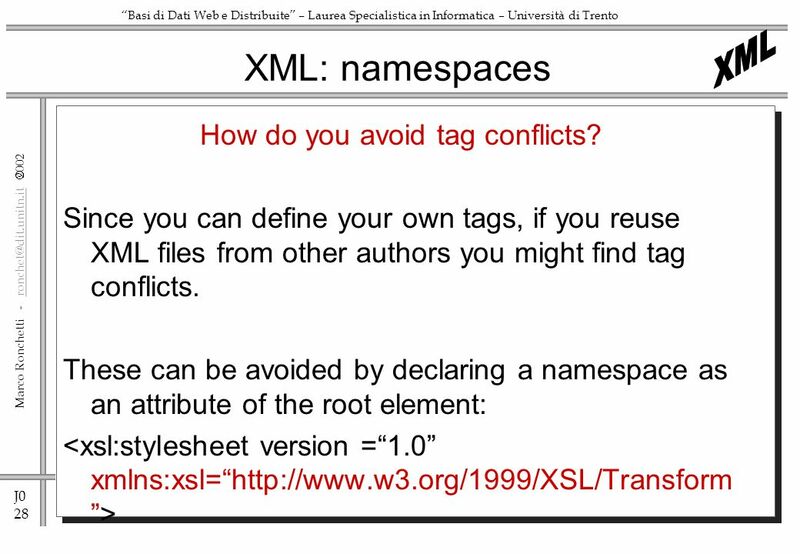 XML is a World Wide Web Consortium standard that lets you create your own tags. 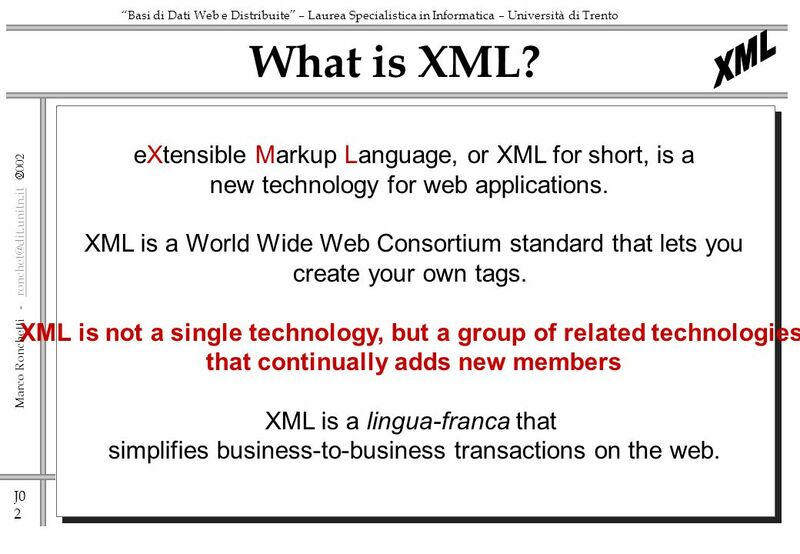 XML is not a single technology, but a group of related technologies that continually adds new members XML is a lingua-franca that simplifies business-to-business transactions on the web. 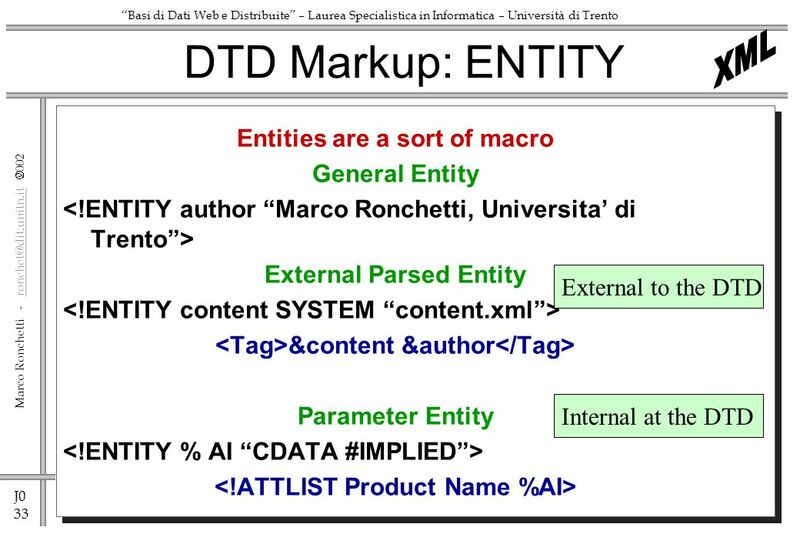 3 J0 3 Marco Ronchetti - ronchet@dit.unitn.it ronchet@dit.unitn.it Basi di Dati Web e Distribuite – Laurea Specialistica in Informatica – Università di Trento XML can reduce system costs In a speech, entitled "Escaping Entropy Death" Phipps (IBM's chief XML and Java evangelist) noted that users are reaching the point where the cost of simply owning some systems is exceeding the value they provide. 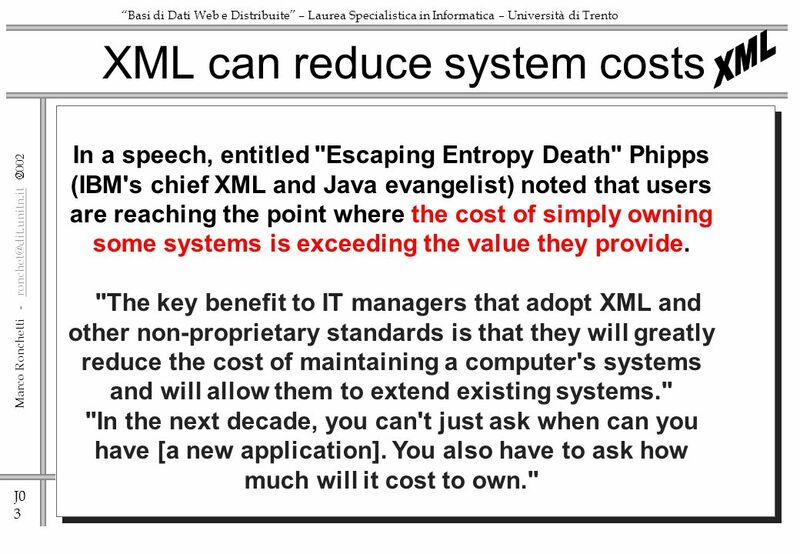 "The key benefit to IT managers that adopt XML and other non-proprietary standards is that they will greatly reduce the cost of maintaining a computer's systems and will allow them to extend existing systems." 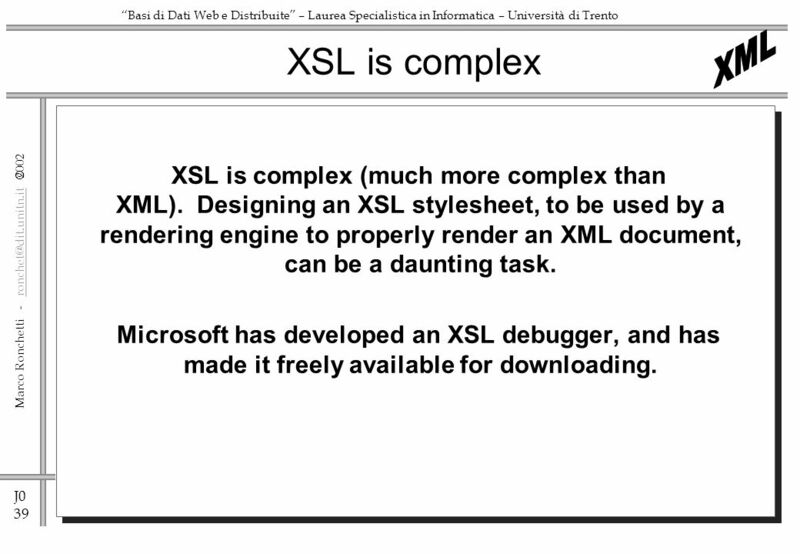 "In the next decade, you can't just ask when can you have [a new application]. 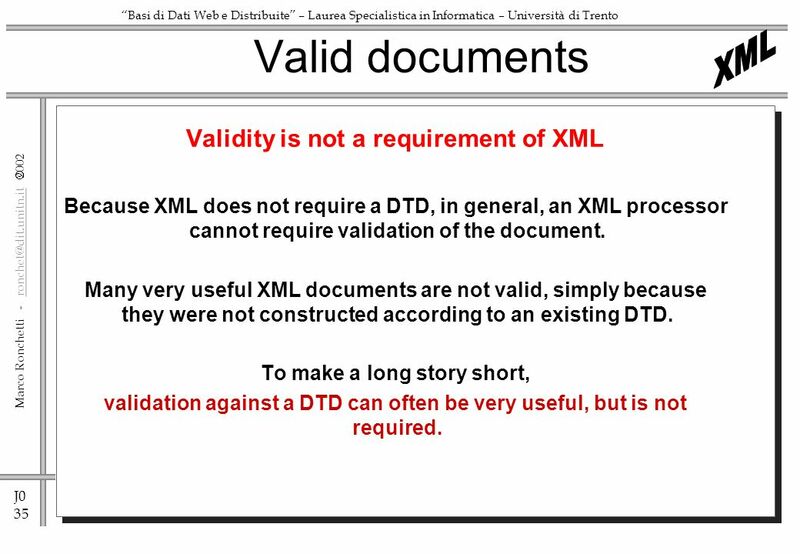 You also have to ask how much will it cost to own." 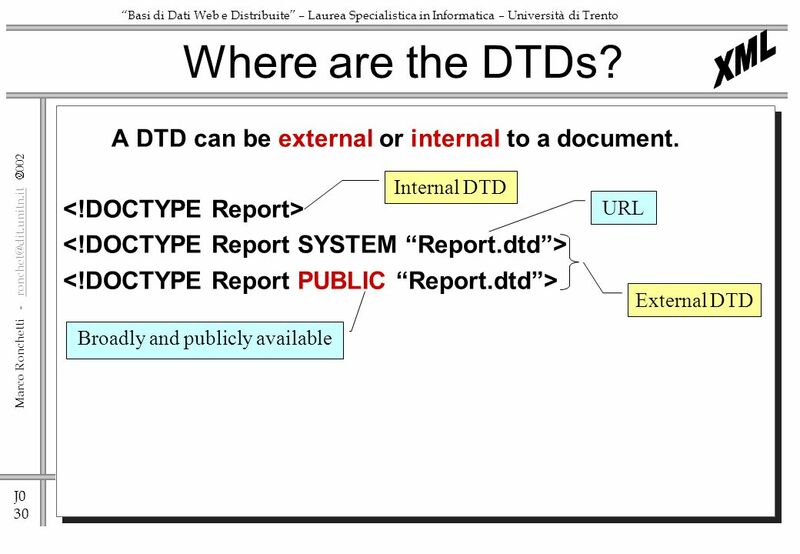 4 J0 4 Marco Ronchetti - ronchet@dit.unitn.it ronchet@dit.unitn.it Basi di Dati Web e Distribuite – Laurea Specialistica in Informatica – Università di Trento Vendor independence in the data-formatting context Phipps went on to say: "Other successful Internet technologies let people run their systems without having to take into account another company's own computer systems, notably: TCP/IP for networking, Java for programming, Web browsers for content delivery. 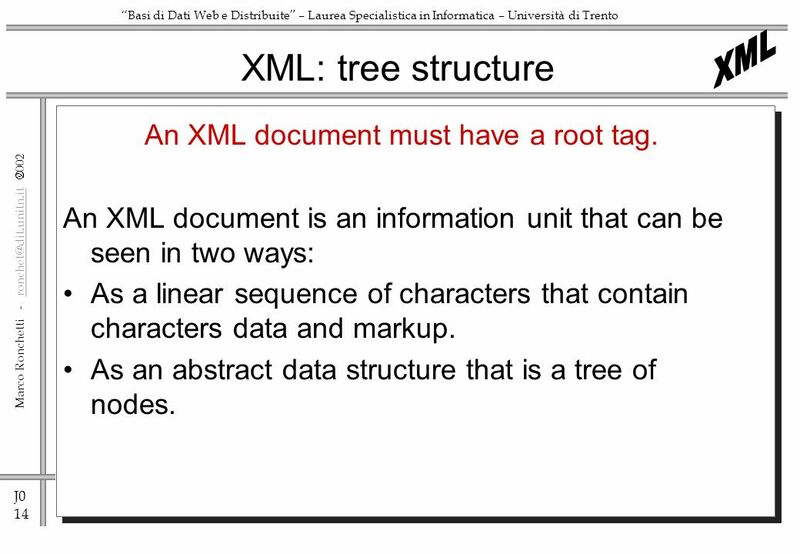 XML fills the data formatting piece of the puzzle. 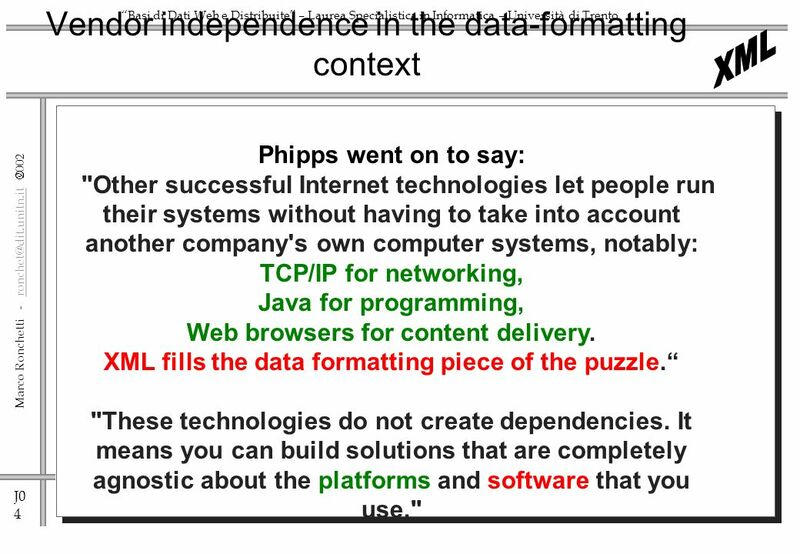 "These technologies do not create dependencies. 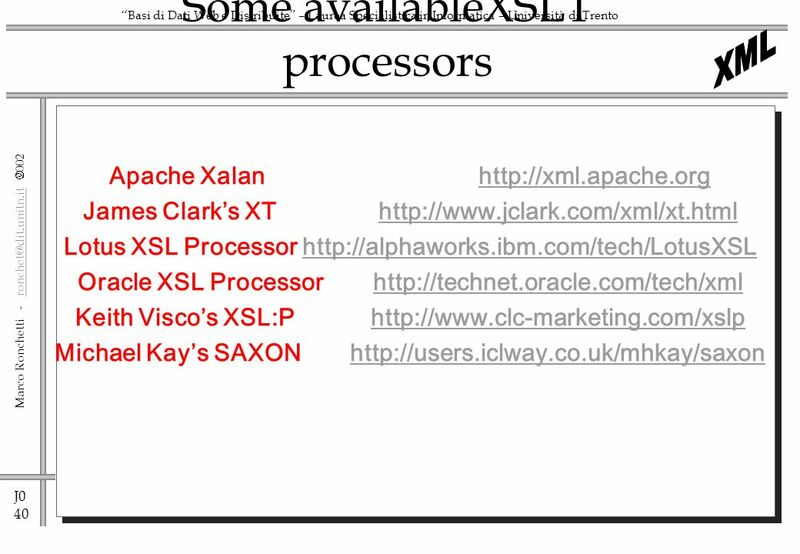 It means you can build solutions that are completely agnostic about the platforms and software that you use." 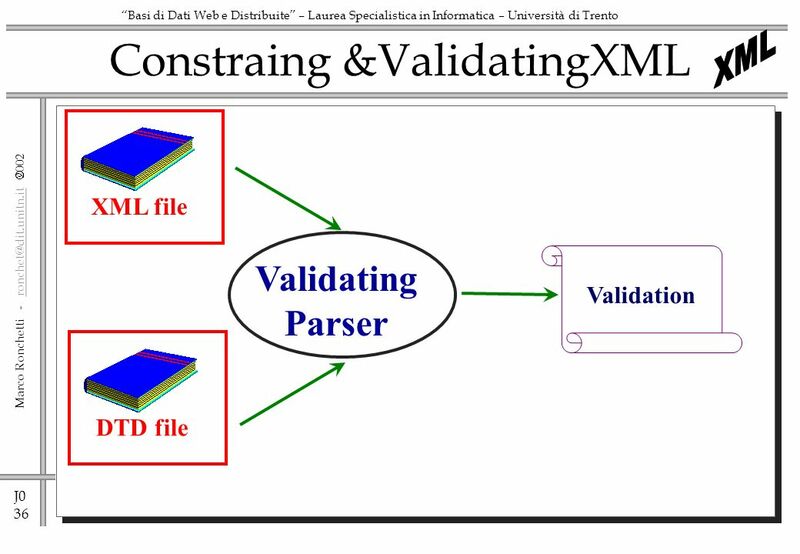 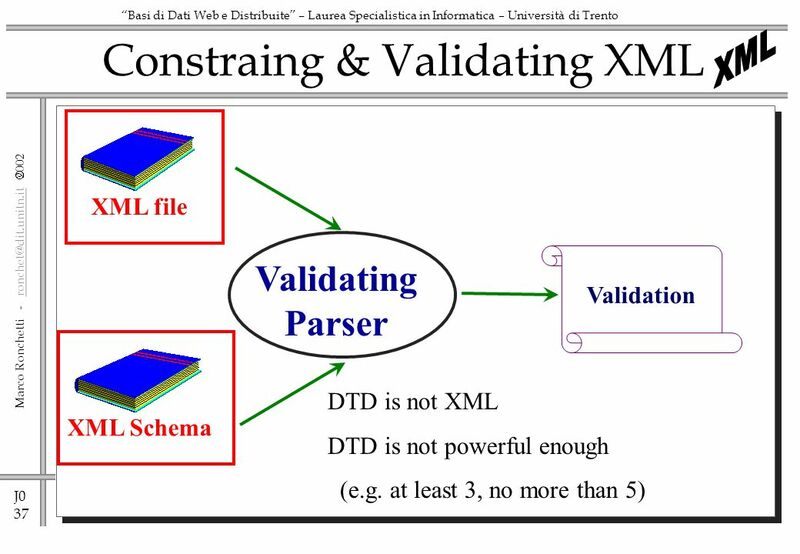 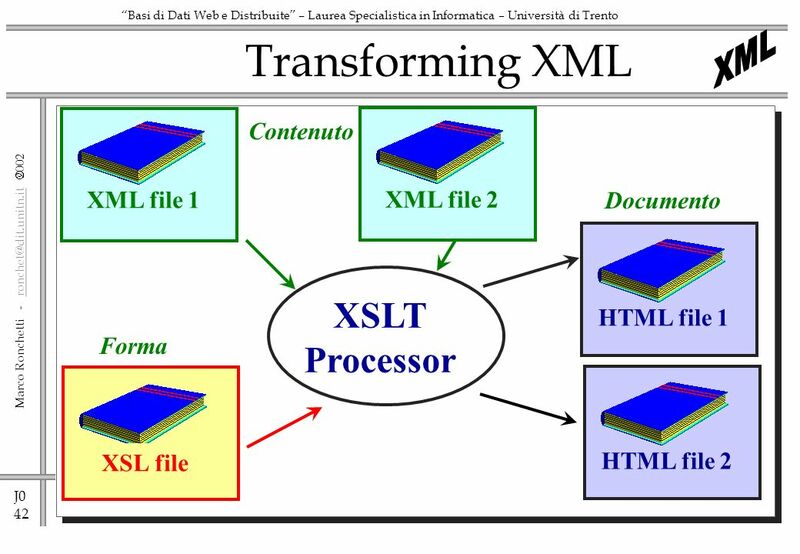 23 J0 23 Marco Ronchetti - ronchet@dit.unitn.it ronchet@dit.unitn.it Basi di Dati Web e Distribuite – Laurea Specialistica in Informatica – Università di Trento A parser, in this context, is a software tool that preprocesses an XML document in some fashion, handing the results over to an application program. 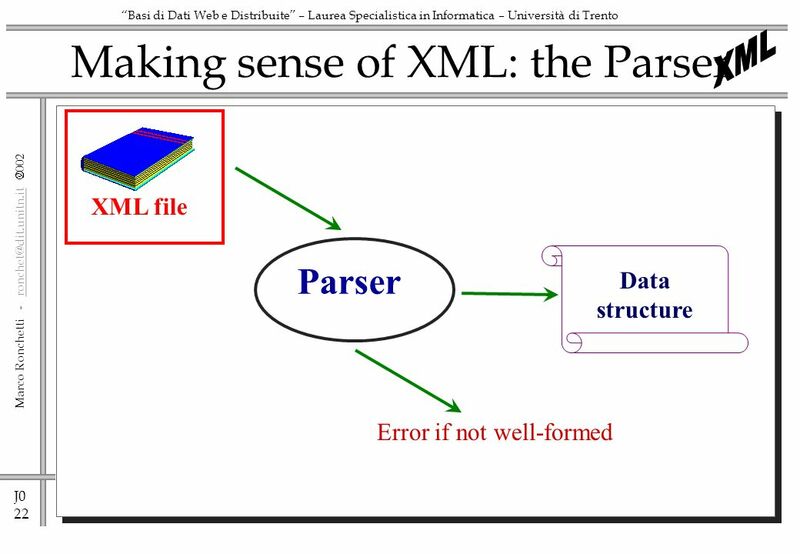 The primary purpose of the parser is to do most of the hard work up front and to provide the application program with the XML information in a form that is easier to work with. 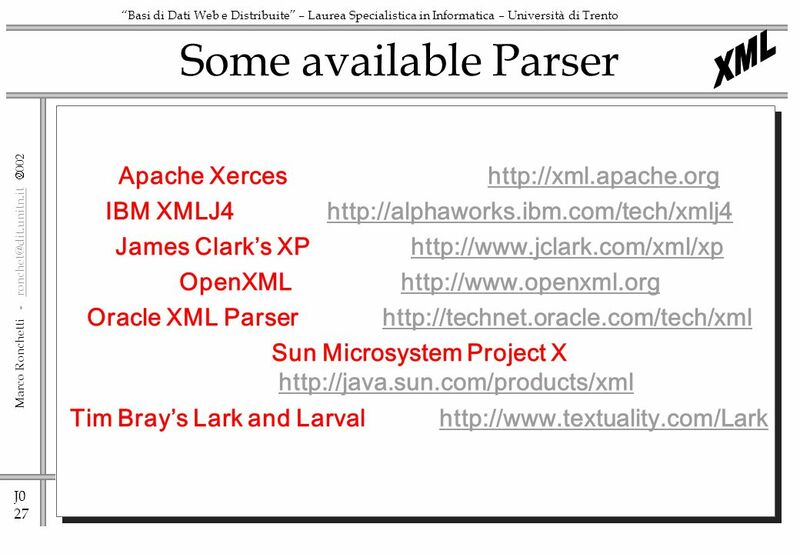 What is a parser? 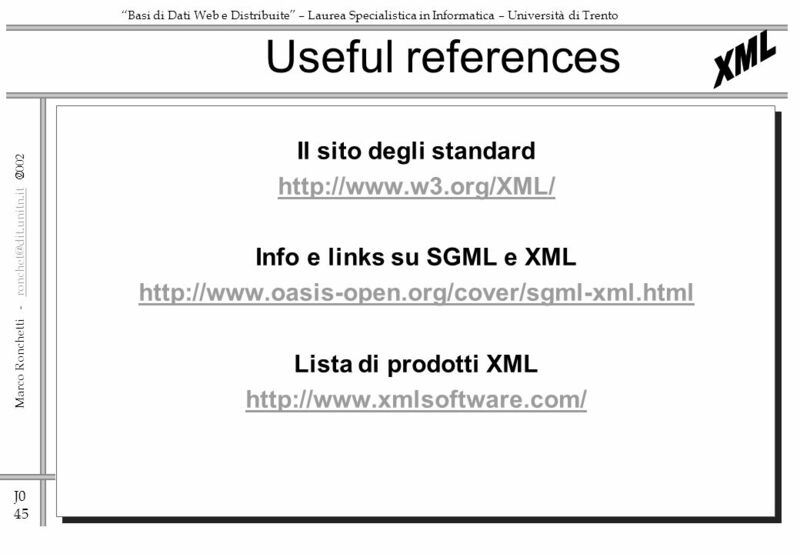 26 J0 26 Marco Ronchetti - ronchet@dit.unitn.it ronchet@dit.unitn.it Basi di Dati Web e Distribuite – Laurea Specialistica in Informatica – Università di Trento SAX is a set of interface definitions For the most part, SAX is a set of interface definitions. 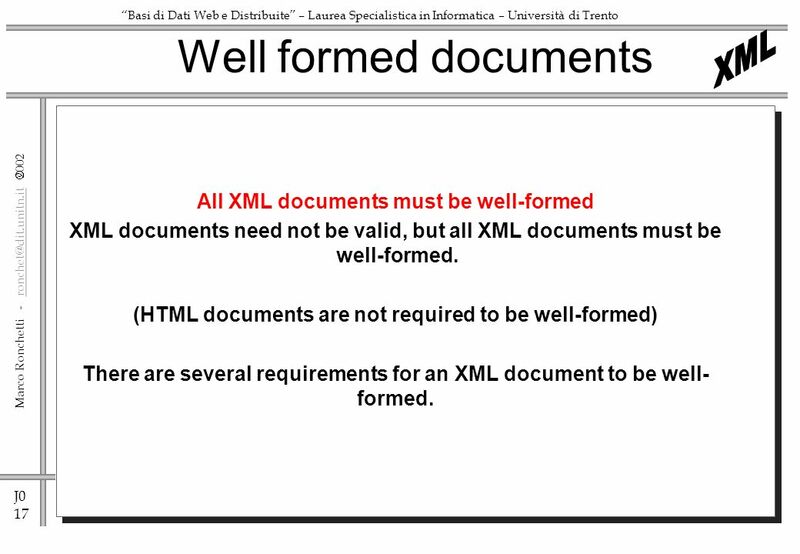 They specify one of the ways that application programs can interact with XML documents. 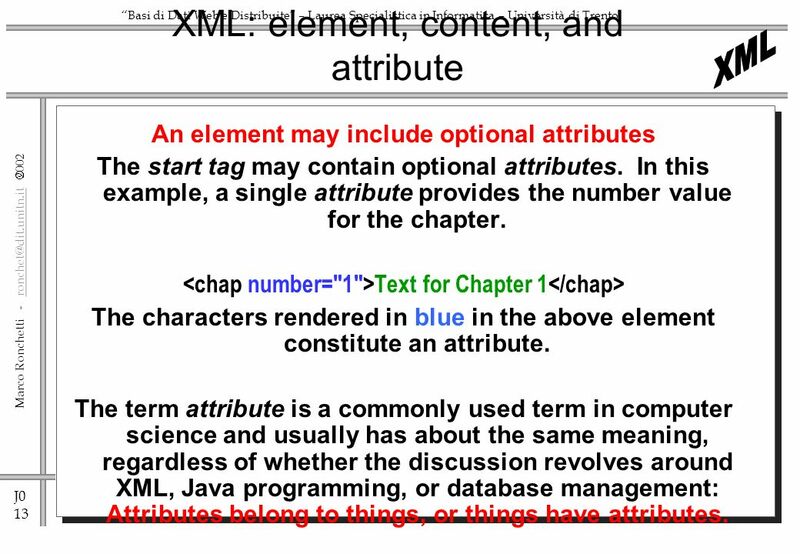 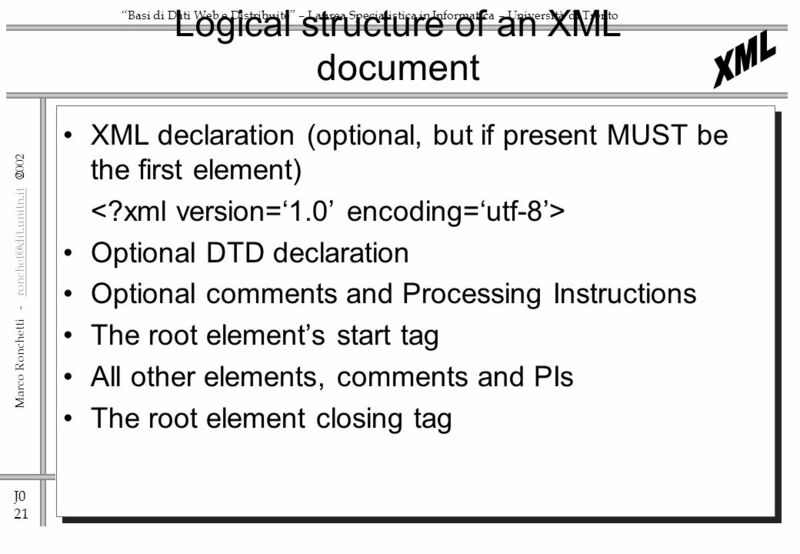 (There are other ways for programs to interact with XML documents as well. 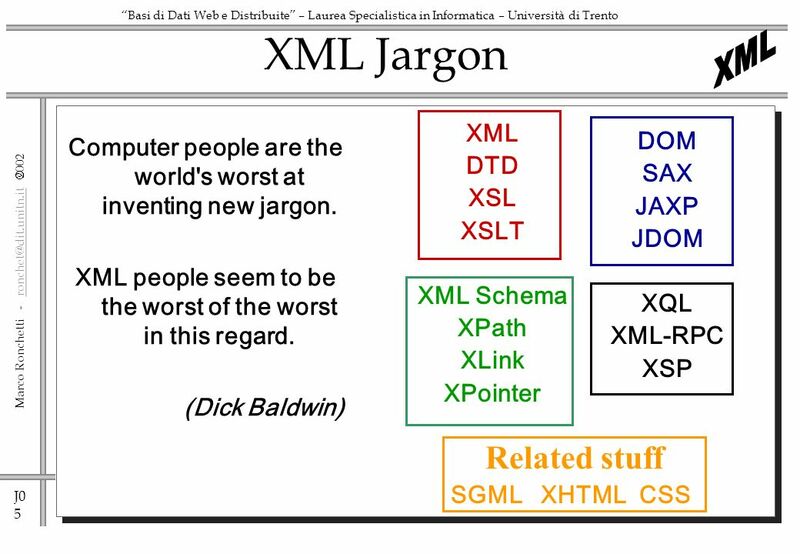 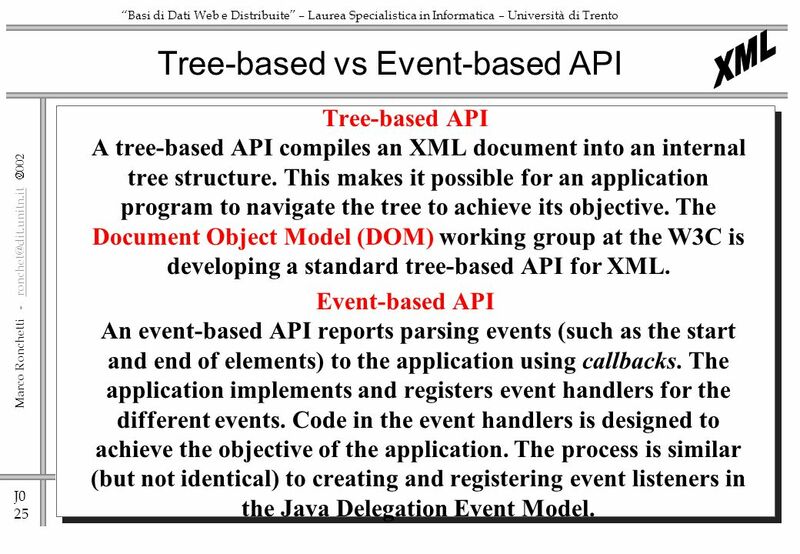 Prominent among them is the Document Object Model, or DOM) SAX is a standard interface for event-based XML parsing, developed collaboratively by the members of the XML-DEV mailing list. 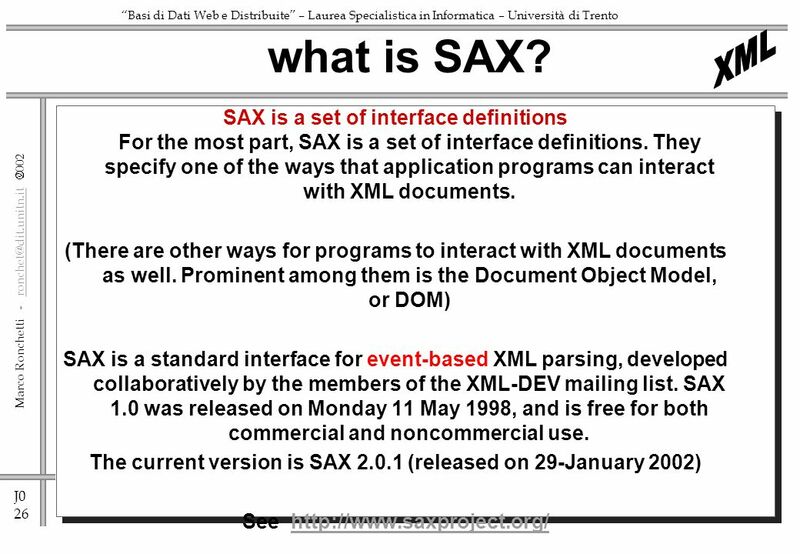 SAX 1.0 was released on Monday 11 May 1998, and is free for both commercial and noncommercial use. 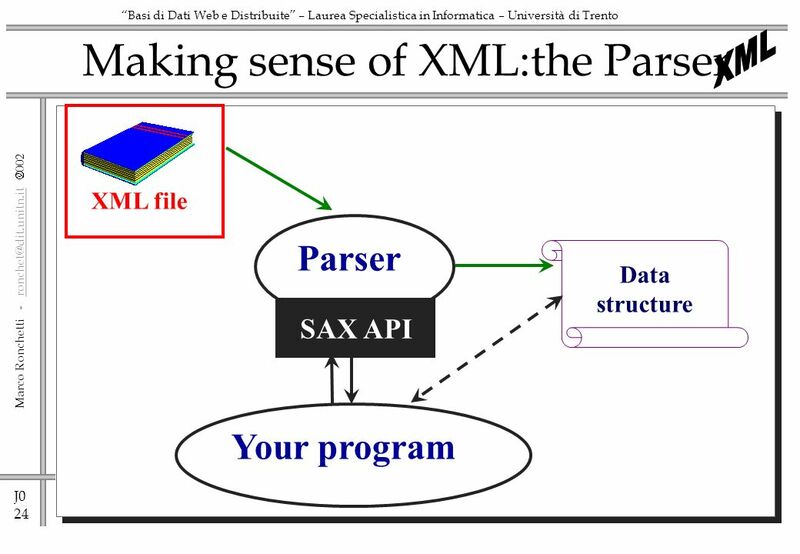 The current version is SAX 2.0.1 (released on 29-January 2002) See http://www.saxproject.org/http://www.saxproject.org/ what is SAX? 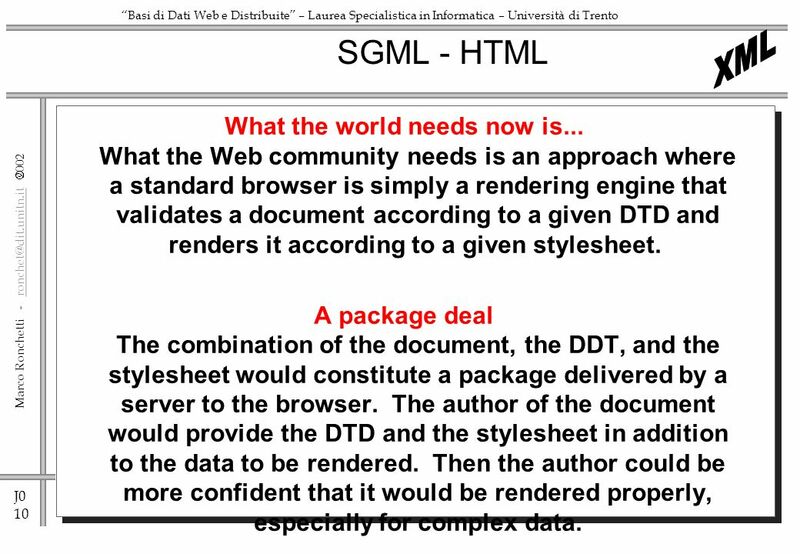 29 J0 29 Marco Ronchetti - ronchet@dit.unitn.it ronchet@dit.unitn.it Basi di Dati Web e Distribuite – Laurea Specialistica in Informatica – Università di Trento A DTD is usually a file (or several files to be used together) which contains a formal definition of a particular type of document. 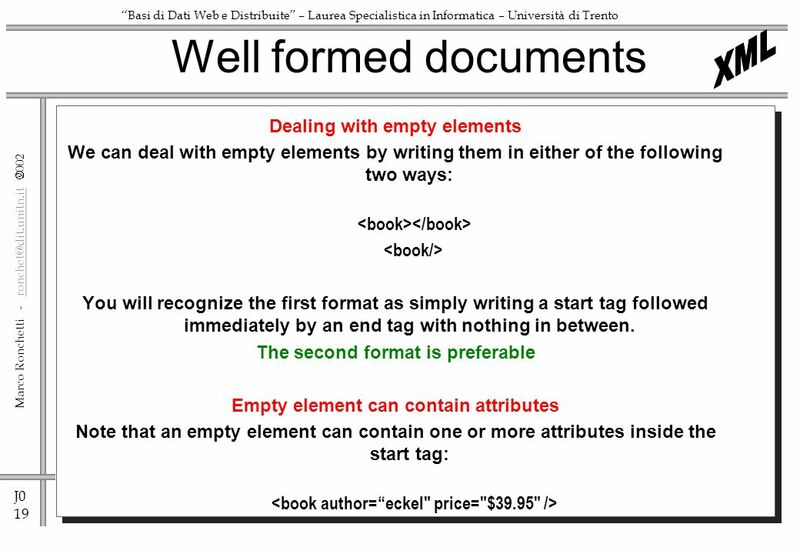 This sets out what names can be used for elements, where they may occur, and how they all fit together. 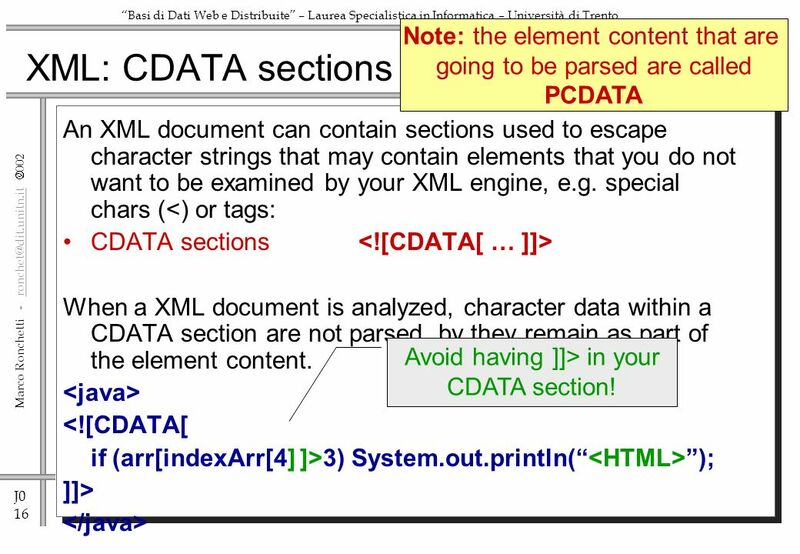 It's a formal language which lets processors automatically parse a document and identify where every element comes and how they relate to each other, so that stylesheets, navigators, browsers, search engines, databases, printing routines, and other applications can be used. 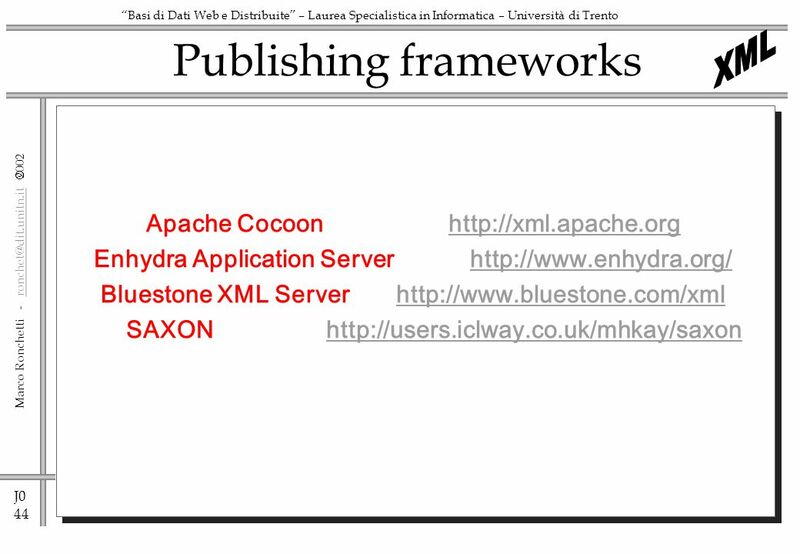 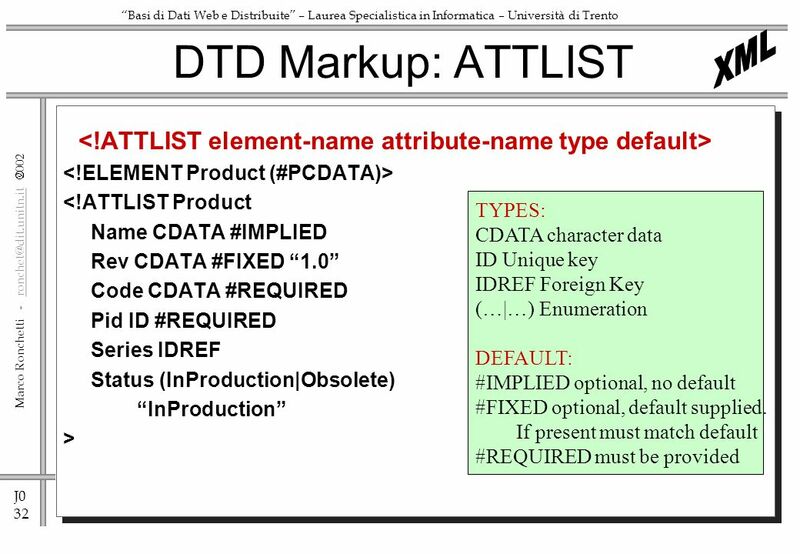 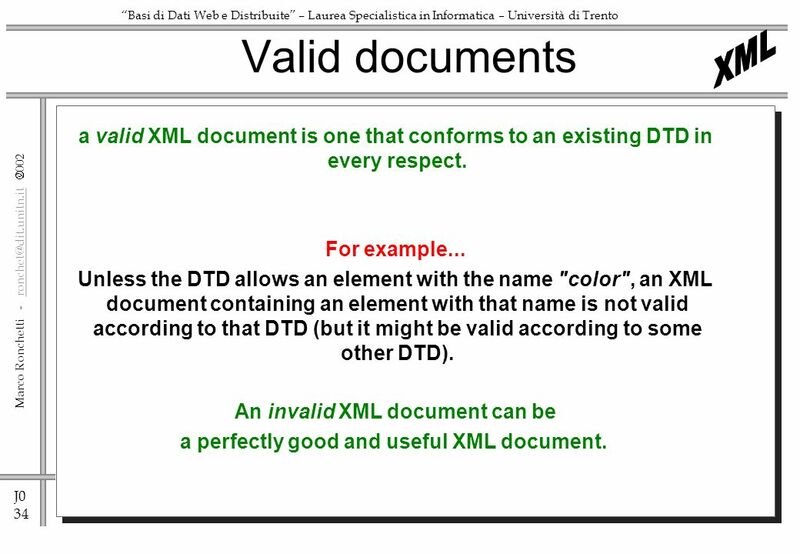 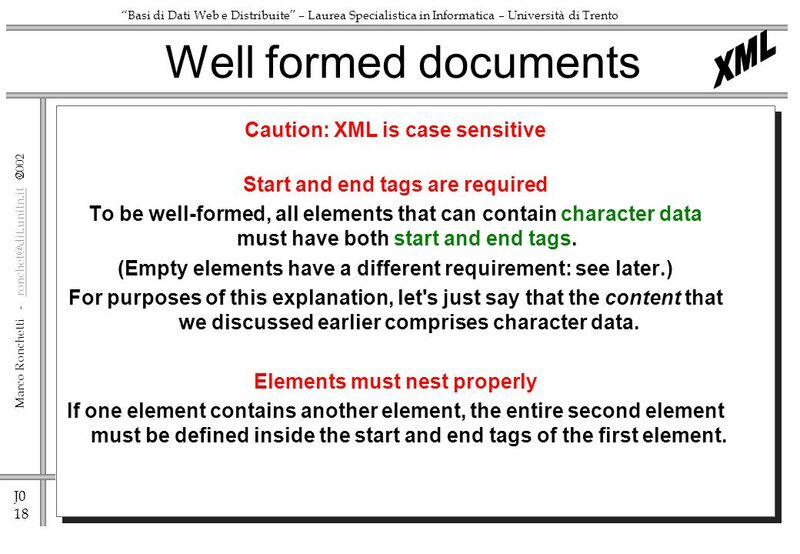 A DTD contain metadata relative to a collection of XML docs. 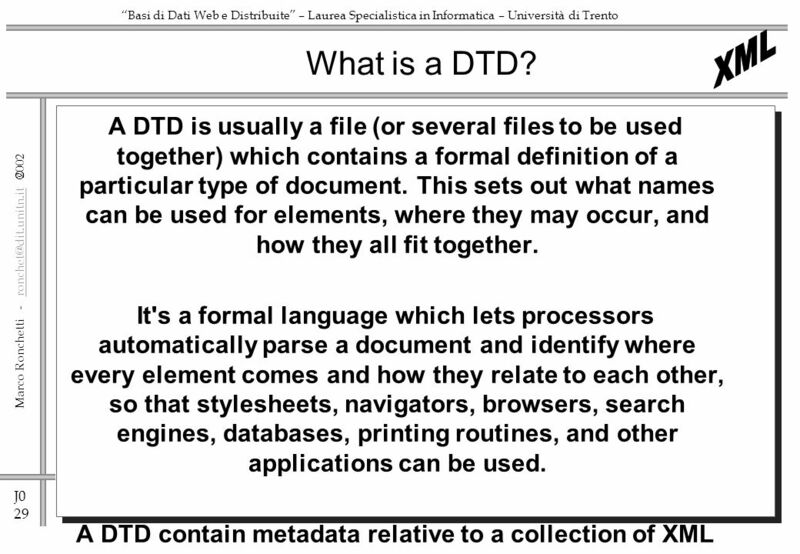 What is a DTD? 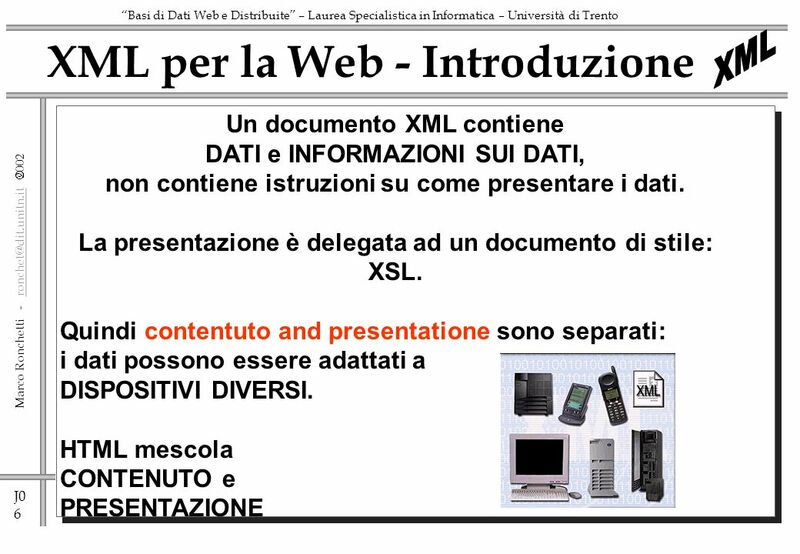 Download ppt "J0 1 Marco Ronchetti - Basi di Dati Web e Distribuite – Laurea Specialistica in Informatica – Università di Trento." 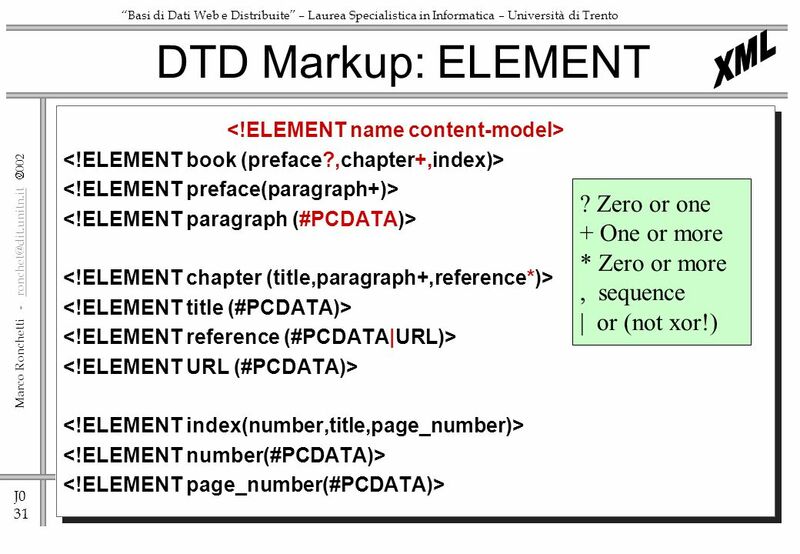 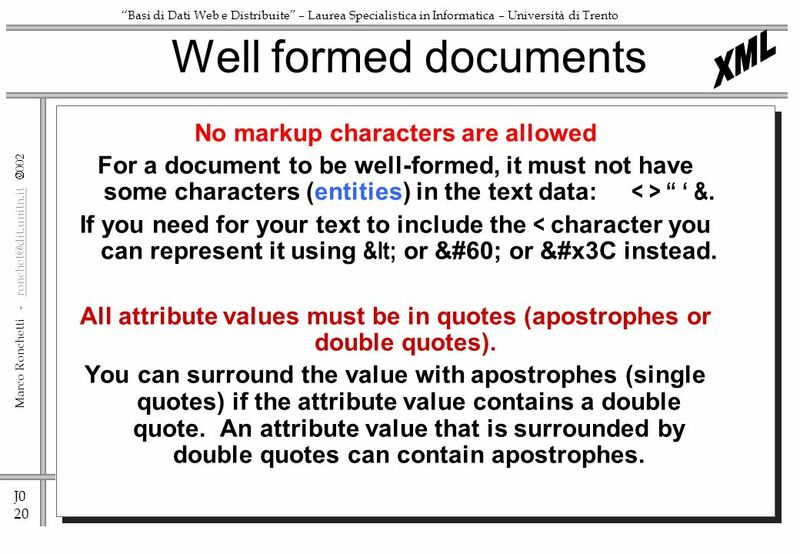 1 eXtensible Markup Language. 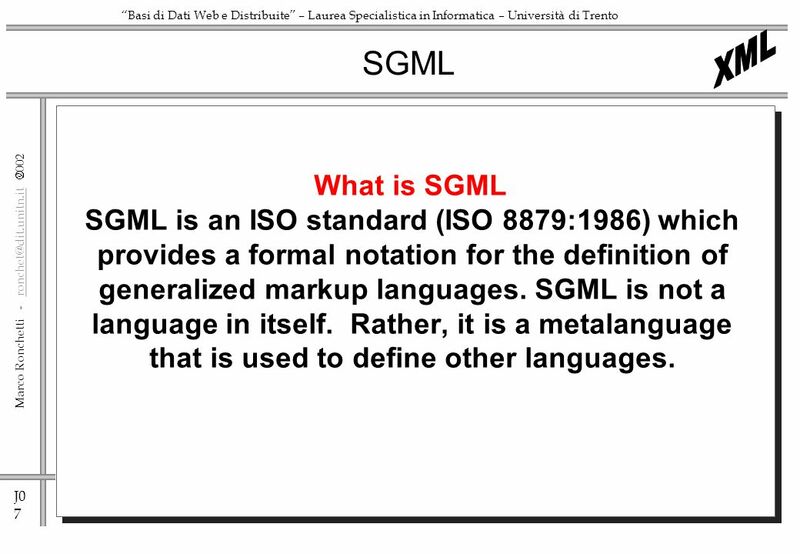 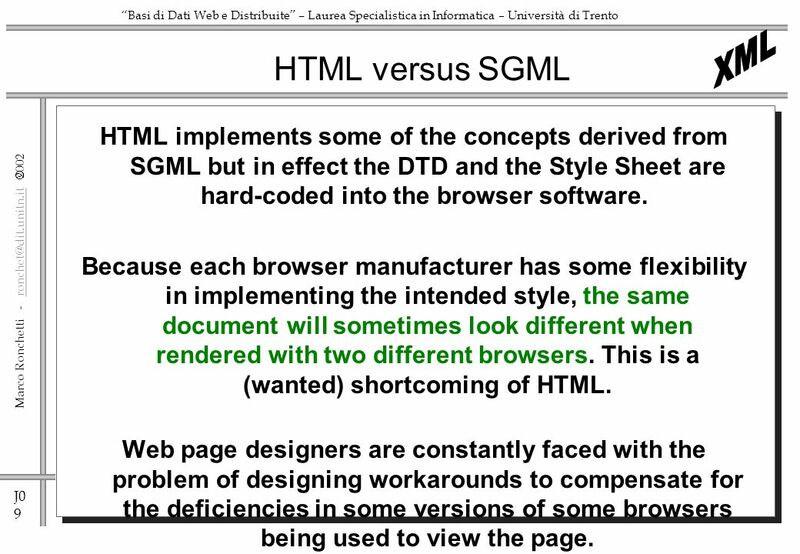 XML is based on SGML: Standard Generalized Markup Language HTML and XML are both based on SGML 2 SGML HTMLXML. 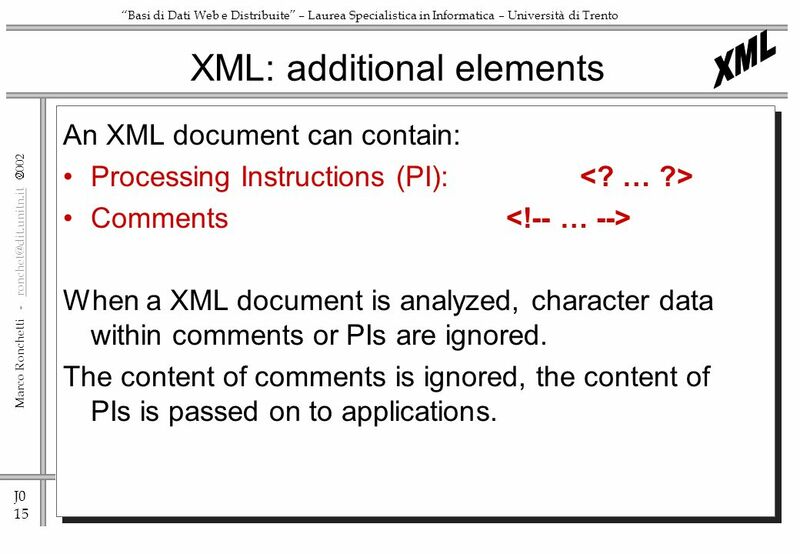 Introduction to XSL XSL-BASIC ELEMENTS. 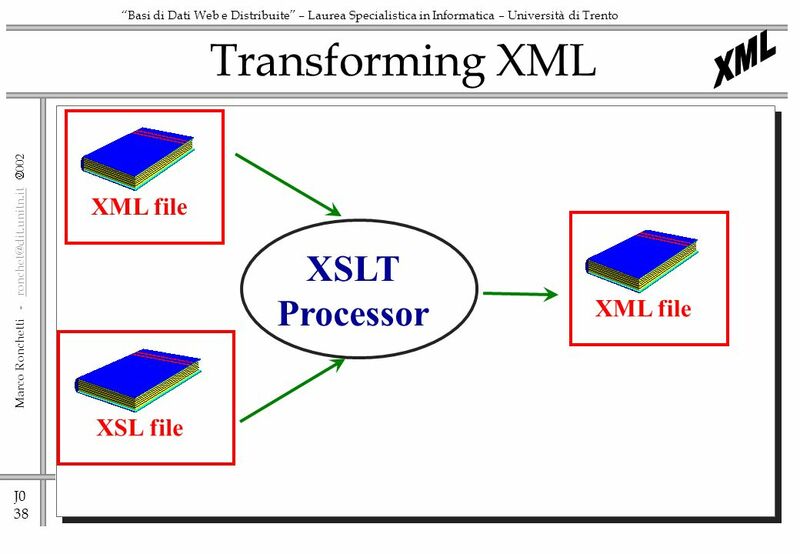 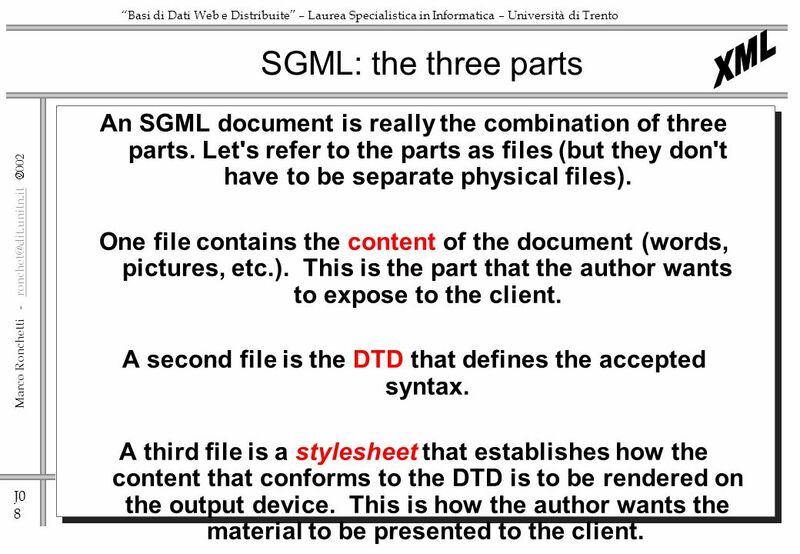 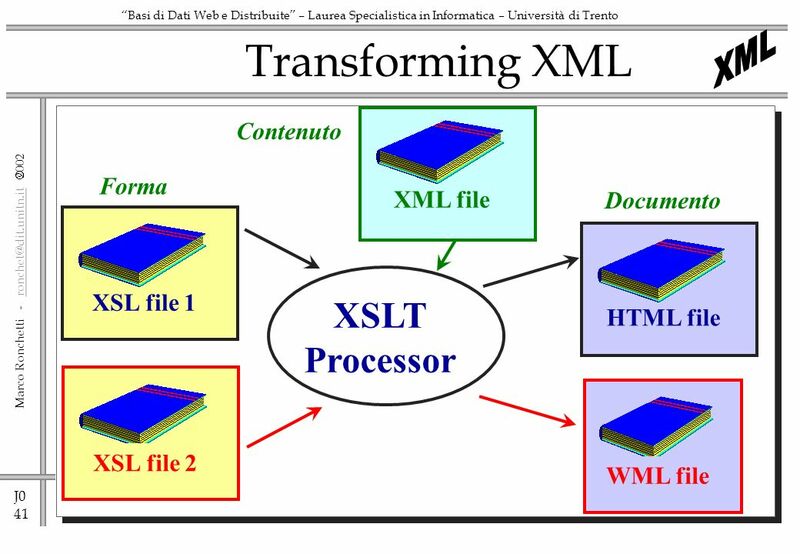 Transforming XML XSL file 1 XSLT Processor WML fileXSL file 2HTML fileXML file Contenuto Forma Documento. 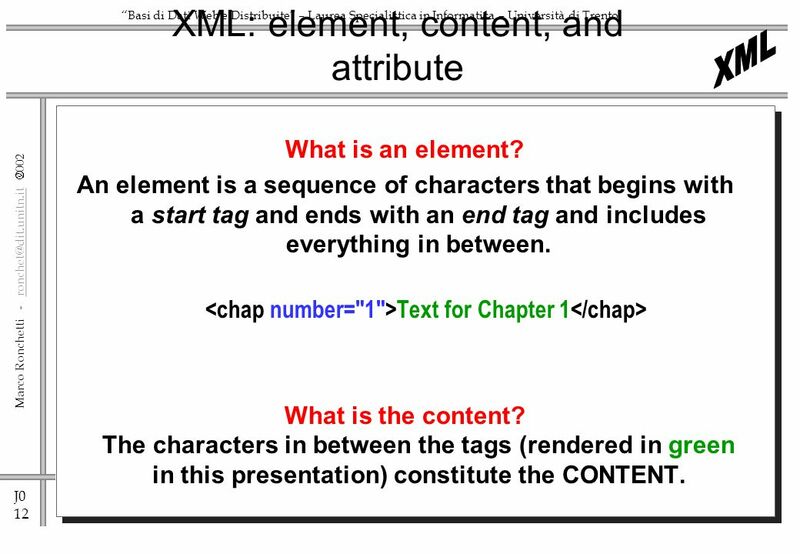 CSCI N241: Fundamentals of Web Design Copyright ©2004 Department of Computer & Information Science Introducing XHTML: Module B: HTML to XHTML.